After training as a schoolteacher, Nigel endeavoured to get involved in the music business. His first job was that of a salesman/demonstrator in an electronic organ retail business in Hyde, Cheshire. Later he opened his own electronic organ business in Sale, Cheshire. 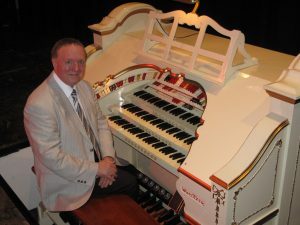 It was during this time that he also started presenting ‘The Organist Entertains’, a programme on which he’d featured many times as a player since 1972. ‘The Organist Entertains’ has been running as a regular weekly feature since 1969, following a pilot show in April that same year. Nigel took over as the regular presenter of the show following the retirement of the programme’s founder and first host, Robin Richmond. When Nigel isn’t presenting or preparing for the programme, he spends much of his spare time traveling around the country, playing concerts of popular light and light classical music on theatre organs and in churches, cathedrals and church halls.